We take pride in our Aéropostale® brand and our customers by designing, sourcing, marketing and selling our own merchandise. As a result, we do not authorize the resale of Aéropostale® merchandise. Unwashed, unworn, or defective merchandise with original price tickets may be returned or exchanged within 60 days of the date of purchase with the original sales or gift receipt. Swimwear and underwear can only be returned/exchanged with the price tickets attached. We may refuse or delay returns if fraud or abuse is suspected. 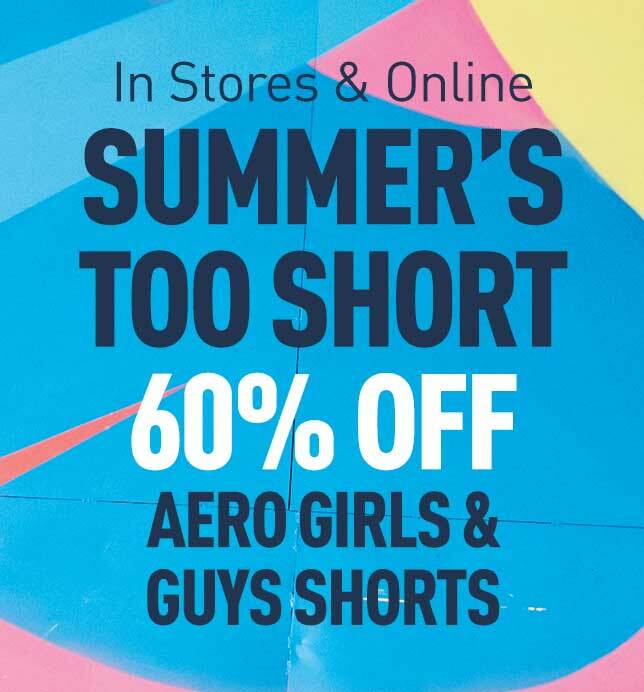 Online purchases, made in both The United States and Canada, can be returned by mail to the Aeropostale Returns Center located at 350 Omega Parkway, Shepherdsville, KY 40165. Only online purchases made in the United States can be returned to stores. Purchases of unwashed, unworn, or defective merchandise made in any U.S. Aéropostale® store may be returned or exchanged within 60 days of the date of purchase with the original sales or gift receipt. Returns with an original sales receipt will be refunded in the manner in which the original purchase was made. Returns with an original gift receipt will be refunded with a Merchandise Return Card at the selling price on the gift receipt. Returns will not be accepted without an original sales or gift receipt. Swimwear and underwear can only be returned/ exchanged with the price tickets attached. ATTENTION INTERNATIONAL SHOPPERS – We cannot process exchanges or returns via the mail. All returns/exchanges of purchases made in a U.S. store must be done in person in one of our U.S. stores and must be accompanied by the original sales or gift receipt. Online-Only items, Online purchases made in Canada, Room Merchandise (including bedding and accessories), and Fragrance cannot be returned to stores. These can only be returned to the Aeropostale Return Center located at 350 Omega Parkway, Shepherdsville, KY 40165. Please follow the directions on the pack slip to refer to the Online Purchase return policy for more details. Online purchases of unwashed, unworn, or defective merchandise may be returned by mail within 60 days of the date of purchase for a full refund to the original form of payment used for this purchase (including gift purchases). Credit will be issued within 30 days of receiving your returned package. Online purchases made in Canada and Online Only merchandise must be returned by mail with the original sales or gift receipt. Returns will not be accepted without an original sales or gift receipt. Items purchased online and picked up in an Aéropostale store must be exchanged or returned to a US store and must be accompanied by the original pickup receipt. All returns will reflect original discounts and promotions. Please select a "Reason for Return" code on the packing slip and include the packing slip in your return package. If you cannot send your packing slip, please include your order number, billing name, and address with the item. If you would prefer to use your own shipping method at your own expense, follow steps 1 & 2 above and return the package via an insured shipping service to: Aeropostale Returns Center, 350 Omega Parkway, Shepherdsville, KY 40165. Sorry, we cannot accept CODs. At this time, we do not facilitate exchanges on international shipments; however, if for any reason you are not satisfied with your purchase, please contact us by email. We will provide you with further instructions to facilitate your return, including the return authorization process, the location to where returns are required to be shipped back, and the amount you will be refunded. If approved, refund amounts for returned items will be credited to you as soon as the items are received and the credits processed by our partner Borderfree. Your refund will be credited in the same currency and using the same exchange rate as your original order. Please Click Here to visit our International Helpdesk.